Family house since 1958. My wife spent her childhood there and revived this house during her seasonal stays which made it very pleasant. House located in a magnificent sunny area, close to downtown and with great comfort. Air-conditioning, shower and WC area, flat screen TV in each bedroom, each one being very bright, comfortable and carefully decorated. Very comfortable home! Well appointed property and gracious hosts! We stayed 10 nights in this lovely home. There are 2 good sized bedrooms both with en suite bathrooms with showers, and a half bath downstairs. Well stocked kitchen where we cooked breakfast every day and a few dinners. Air conditioning worked really well throughout the house, beds were comfortable, nice linens. Jean-Pierre and Christiane were delightful hosts. Warm and welcoming and great communicators during the reservation process and while we were there! Jean-Pierre offered to drive us to the TGV to pick up our rental car - very thoughtful and generous! They were very responsive to our needs and we enjoyed our conversations. The walk into the city center is about 15-20 minutes. It's not the most scenic walk to the walled city yet it is nice when you get there. In our opinion, a rental car is needed to be able to explore the various towns and vineyards of Provence. Avignon is a central location with an average drive of about 1 hour to several towns. Such a pleasure to communicate with and meet the owners, Christiane and Jean-Pierre Devillard. Great location to visit Avignon and all tourist attractions in Provence. Well equipped, tastefully decorated house. Secure parking is a huge bonus. In the pleasure to receive you again in Avignon in "la cité des Papes "..
We had a excellent holiday. With this as our base in Avignon, we toured around Provence. Jean-Pierre was very welcoming and flexible with our travel arrival and departure times and messaged us to check we were ok after a thunder and lightening storm, which we thought was very caring. The house was very well equipped and extremely comfortable. Thank you very much. 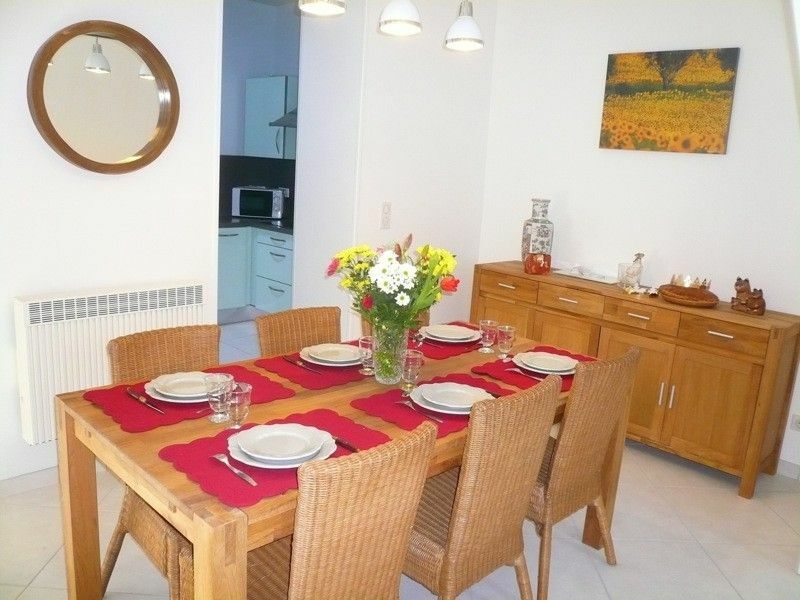 This apartment was the perfect place to stay in Avignon. The house has been beautifully renovated to preserve the sense of age while providing every modern comfort. We didn't stay here in the summer but were still surprised to find that it is air-conditioned. That's one of the many reasons we hope to return. It would be a perfect summer location. We were impressed by the gated parking, the short walk to the old city, and the comfort of the beds. We stay in HomeAway rentals frequently and always look for the information left by the owner. Jean-Pierre met us when we arrived, made us feel very welcome, and took us through the house explaining everything we would need to know. Too frequently, we realize later that we have forgotten what we've been told. That's when written information becomes very important. We were so pleased to find a folder that answered all of our questions and did it clearly and well. Though we knew we could have called Jean-Pierre whenever we needed, we found that everything we needed to know was in the folder. We had a very pleasant stay. We were there in November when the days are cooler and shorter. It was so nice to be able to come "home" to comfortable place where we could prepare our own dinner when we chose to do that. When it was time to leave, we had a very early departure for our flight from Nice. Jean-Pierre met us in the early morning for our check out. We felt as if we were leaving a friend. We enjoyed the property very much, it was extremely comfortable and we used it as a base for day trips in Provence. Jean Paul met us when we arrived and did a great job explaining everything in the property. It was GREAT to have parking on the property! He provided us with a map of where the Grocery store , butcher, etc. were, all conveniently close. We loved the butcher, who was very accommodating as we generally cooked our evening meals at the house. Having a wash machine was great. We found it very quite. It was a 15 minute walk to the old city, which was quite easy and allowed us to explore the city multiple times! We communicated through email, and Jean Paul responded promptly. Check out was uneventful and he accommodated our schedule. We would highly recommend this property to anyone who either has a short or long stay in Avignon. Again, it's a great base for exploring the rest of Provence. Although there were just the two of us, it would be a great stay for two couples or a small family! Christiane and jean - Pierre. Visit the Pont d'Avignon, the Palais des Papes, Avignon and its famous ramparts, the Avignon festival in July, the Pont du Gard, Fontaine de Vaucluse, Mont Ventoux, Chateauneuf du Pape, Orange and its theater, Arles, the Camargue, the Baux de Provence and St Rémy de Provence, the Alpilles, Maillane birthplace of Frédéric Mistral, Beaucaire and Tarascon, Saintes Marie de la Mer, La Grande Motte, Le Grau Du Roi, Nimes and its bullring, Vaison Romaine, Luberon, Aix en Provence, Cassis, Marseille and its creeks ..
noter : pour des vacances sans soucis, un forfait de 40 € ménage/linge est appliqué par séjour , il comprend : - le ménage de fin de séjour, - la fourniture du linge de maison complet (draps, serviettes de bain, torchons, serviettes de table) etc... - les lits faits à l'arrivée, - la fourniture de tous les produits de base pour démarrer sereinement votre séjour : produits ménager/sopalain/papier toilette/ sacs poubelles etc... - la mise à disposition d'un fond de placard : thé/café/sucre.... - consommation eau/électricité/climatisation... - Une caution de 500 euros sera demandée ,non encaissée et rendue en fin de séjour. En especes ou par virement pour les étrangers.